Goldberg. Schulich. Fountain. Killam. Rowe. These are just a few of the famous family names whose generous support has helped form the Dalhousie we know today. 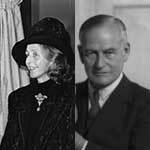 But the title of Dal’s first power couple of philanthropy likely belongs to the Dunns, Sir James Dunn (1874-1956) and Lady Marcia Dunn (later Lady Beaverbrook, 1909-1994). Sir James was a Dal Law School alumnus (1898) who became a financial and industry giant. Lady Dunn (Marcia Christoforides, known as “Christofor” to most) was his long-time secretary and trusted advisor, 35 years his junior, who became his third wife in 1942. The age gap may have limited their time together—Sir James passed after 14 years of marriage—but it was long enough for them to share a deep commitment to Dalhousie, sparking a legacy of generosity spanning nearly an entire century. Sir James was born near Bathurst, NB. He made his fortune through a stock company started with funds borrowed from his father-in-law, ending up in leadership roles in companies like Algoma Steel (based out of Sault Ste. Marie, Ont.) and Canada Steamship Lines. He moved to London, England, in 1905, where his financial network continued to grow and he became “Sir James” after being knighted in 1921. Throughout, he was one of his alma mater’s most loyal and generous donors, helping launch the Dalhousie Forward Movement campaign that built the core of Studley Campus and also supporting several academic chairs in law. He received an honorary degree from Dal in 1948, and at the time of his death was serving on the university’s Board of Governors. Half of his $68 million estate went to Christofor. Originally from Sutton, England, Lady Dunn was educated at Roedean School before becoming Sir James’s secretary in 1930 and his wife just over a decade later. Her husband’s partner in every sense of the word, she was eager to continue the relationship with Dalhousie following his death. Over the years that followed, Lady Dunn and the Sir James Dunn Foundation donated millions to the university: $2.5 million for the construction of the Sir James Dunn Science Building (1957), support for the Sir James Dunn Law Library and several law scholarships, funding for the Dunn Theatre in the Arts Centre and, in 1985, $2 million to restore the Weldon Law Building and its library holdings after a devastating fire. Lady Dunn—who became Lady Beaverbrook in 1963, marrying then-UNB chancellor Lord Beaverbrook—was no passive donor. Deeply involved in her projects (often to the chagrin of administrators), she made her voice heard on everything from architectural designs to ensuring appropriately celebratory beverages were available at opening ceremonies. Wrote Dal historian P.B. Waite: “No one has ever given [Dalhousie] so much money nor created more problems in its giving.” Lady Beaverbrook’s support was clearly worth any perceived trouble, though, which is why she was awarded an honorary degree in 1967 and, a year later, was invited by President Henry Hicks to become the university’s second chancellor, a role in which she served for more than two decades. At the time of her death in 1994 at the age of 85, Lady Beaverbrook’s foundations and trusts had donated more than $24 million to Canadian organizations, investing in animal welfare, in culture, in education. In funneling many of those millions towards Dalhousie, she not only paid great tribute to the spirit of her late husband — she has shaped the Dal experiences of thousands of students.